The use of the Warwick Castle grounds for glamping will be able to continue despite some opposition. Merlin Entertainments, which owns Warwick Castle, submitted plans to Warwick District Council to renew their permission to have glamping tents on the Castle Grounds. At the end of October the plans were given the green light, which now means that Foxes Study can be used as a glamping site for five months a year up to and including 2022. ‘Glamourous camping’ also known as Glamping has been taking place at Warwick Castle since 2014. It was first introduced in Foxes Study between 17 May and 9 September 2014, which also had a medieval theme. Following its success, permission was secured for a further three seasons from 2015 to 2017. The glamping seasons at the castle run from May to September. For the last three seasons there have been 43 glamping tents as well as facilities including a banqueting tent, toilets and showers. In 2016 the Knight’s Village, which is made up of wooden accommodation lodges, were also added to the Foxes Study site. The new planning permission will see 37 glamping tents instead of the previous 43 tents. The Warwick District Conservation Advisory Forum, which is made up of several different groups including the Warwick Society and the Warwickshire Gardens Trust, believed that the glamping on the site should have come to an end when the permission ended. In the minutes from their meeting where they discussed the plans they said: “The proposed change of use for glamping, combined with the permanent lodges, would result in an over-intensification of the use, which would harm the experience of being in the Grade I Park, and may harm ground conditions, ecology, and the overall significance of this part of the Grade I Registered Park. “The number of tents would result in a potentially squalid appearance and would harm views from the other side of the river, and would potentially result in substantial harm to the significance of the Grade I Registered Park. “Part of the justification for the permanent lodges was that the glamping tents would be removed, and this should now happen. 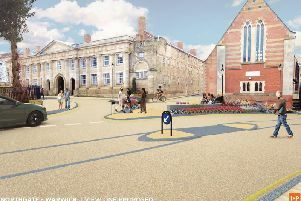 Historic England also echoed the views of the forum and said that they had hoped the glamping would come to an end after the opening of the Knight’s Village but they did not object to the plans. Merlin Entertainments have been approached for a comment. James Mackay, chairman of the Warwick Society, said: “The society regrets very strongly that the council has given permission for glamping to continue. When the application for the lodges was approved the glamping was going to come to an end. Nick Blofeld, divisional director of Warwick Castle, said: “We are delighted to be able to continue offering our seasonal Glamping accommodation to visitors to the area.